Pets that are significantly matted (on a scale of 1 to 10, if the matting is a 5+) are in a health crises. Severe matting hinders blood flow to the skin and prevents proper circulation through the coat and skin. Matting can trap dirt and bacteria and can be lumpy making it uncomfortable for the dog to lie down. Matting can also prevent proper movement of the limbs and cause discomfort. The Florida warm weather and constant humidity tends to accelerate matting in many breeds. If you choose to leave the coat of your toy breed or spaniel on the long side, you should brush your pet every other day to prevent mats from developing. This is time consuming and with your busy schedules and demands of family and work it is often difficult to keep this up. Most of our customers keep their pets in a manageable puppy cut which is refreshed about every 6 weeks. Should your pet become matted, it is in your pet’s best health interest to go ahead and do a complete shavedown- ears, face and all. While it does not look attractive when finished, it is the least painful option for your pet. It is the kindest thing you can do for your dog under the circumstances. Then, you can start over and in about 12 weeks, with routine puppy cuts. Hair does grow back and with a total shavedown, you can allow the health of the skin to improve and the hair will grow back healthier. 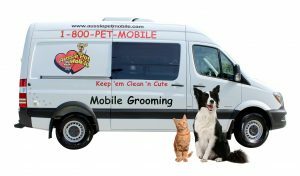 Our groomers will highly discourage the brushing out of significant matting. This will hurt your pet and oftentimes will cause fear aggressive behavior towards future grooms. 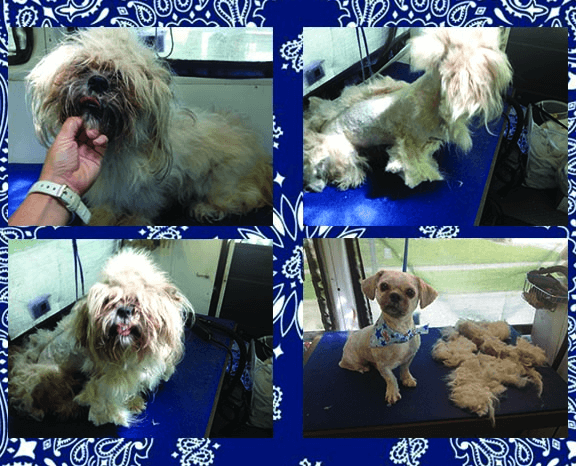 Below are pictures of a severely matted pet that had to be shaved. Often, there are open sores or scabbing underneath the mats. Also once the matting is removed, the blood in the tiny capillaries rushes to the surface and can burst causing what looks like a rash, cut or razor burn streaks. We have even seen cases where the blood burst through the skin of the ear once matting was removed. 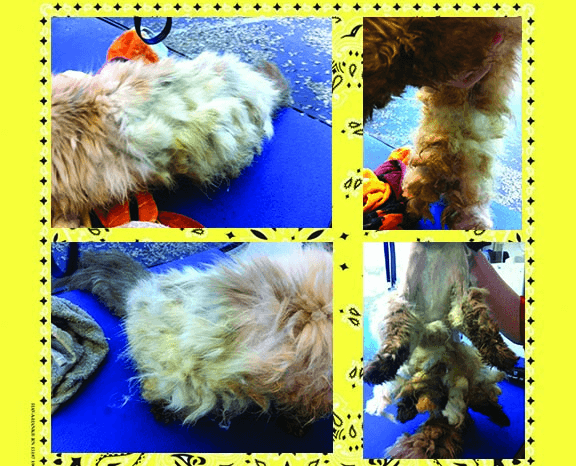 This is an unfortunate side effect and what we do not see it in all matted pets but we have seen it plenty of times. Once the matting is removed, proper air flow and circulation can begin and these will heal. Hair grows back and when it does, be sure to provide regular grooming and puppy cuts to prevent this situation in the future.